'Concentration camp' it was the place where once time women, children and old people were kept in captivity. Robust male were being used from morning to night. The mother was forced to be dragged in front of her child, they did not return. Civilized, educated, white people have not eaten day after day and forced to lie in own excretion. The blood flow in this region. The bodies of more than one million men and women are mixed in this soil. The Jewish Concentration camp under Hitler's Nazi army. 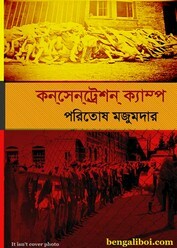 Read this Bangla book and known about the Concentration camp where Jews were killed by Hitler's Nazi army.